SIAMTREAT 999 is an excellent antiscalant and dispersant for reverse osmosis system. It can reduce membrane cleaning frequency by preventing membrane fouling from inorganic scale , metals and colloids.SIAMTREAT 999 is effectively control calcium carbonate , calcium sulfate , calcium phosphate , strontium sulfate , barium sulfate , aluminum and iron fouling. It �s also control silica fouling up to 200 ppm SiO2 in brine. SIAMTREAT 999 is compatible with all type of membranes. It�s very stable in high TDS water including sea water. It will not precipitate or foul the membrane even at very high concentration. It � s safe for membrane in case of accidental over dosing. SIAMTREAT 999 contain no phosphate or phosphonate so it will not contribute to biogrowth in tank or piping system. SIAMTREAT 999 dose rate must be determined by calculation software which will supply from distributor. 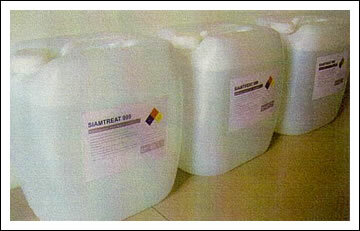 SIAMTREAT 999 is comply with ANSI/NSF standard 60 requirement. It can be used for portable water system. SIAMTREAT 999 is available in 30 kgs drum.